Dou Zecheng could scarcely believe it as he became the first Chinese to earn a prized US PGA Tour card, saying his rise to the world's richest circuit was "going to be pretty big". 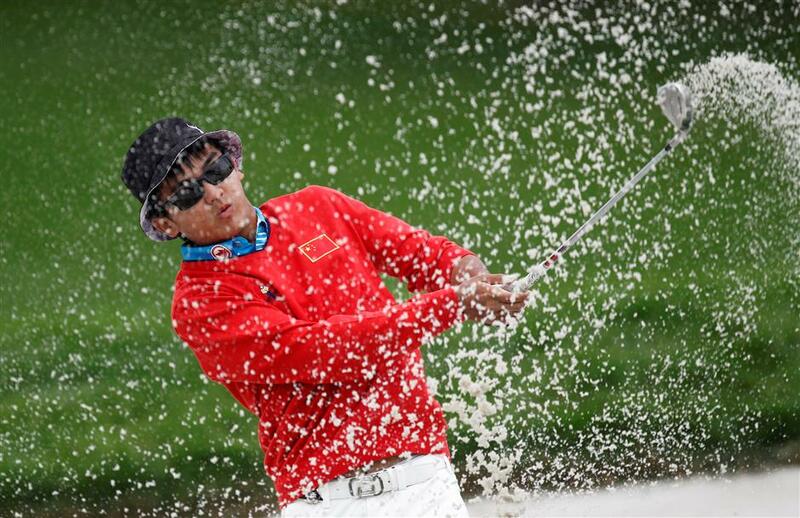 Dou Zecheng of China hits a shot from a bunker on the 11th hole during the final round of the HSBC Champions at the Sheshan International Golf Club in Shanghai in this November 9, 2014, photo. Rising talent Dou Zecheng became China's first player to secure a US PGA Tour card on Sunday by winning the Digital Ally Open on the Web.com Tour. Dou's victory, the first for a Chinese on the developmental circuit, continues the 20-year-old's impressive rise after he bagged four titles in the PGA Tour China Series last year to top the Order of Merit and earn his Web.com card. "I hope (my win) will bring more young players from China to come out and play golf... and give them more confidence when they come out here and play," the bespectacled Dou said in a video interview posted on the PGA Tour's website after winning the Kansas event by three strokes. "This is going to be pretty big... I never thought I could win this year but it just happened." Dou earned US$117,000 to jump from 53rd to 15th on the money list with US$185,594, more than enough to wrap up a PGA Tour card with only four events left in the race for 25 spots. "It's going to be pretty big," said Dou, who travels with fellow Chinese player Zhang Xinjun. "We've been talking to the Chinese media this year about a Chinese player potentially getting to the PGA Tour. 'How soon will they get their card?' and I just did it here...."
With rain washing out the first day's play on Thursday, the last two rounds were held back-to-back on a marathon Sunday and Dou made his charge early at the Nicklaus Golf Club at Lions Gate. He flirted with a course record during a third round of 61 before coolly closing out the win with a 66, finishing with a 25-under total of 259, three ahead of second-placed Americans Kyle Thompson, Luke Guthrie and Billy Kennerly. Born in China's heartland province of Henan but raised in Vancouver for part of his childhood, Dou turned professional at 17, electing to forgo university and return to his homeland to hone his career. The PGA Tour China, a circuit that offers promising Chinese golfers like Dou a chance to win a Web.com card, has struggled to get approvals for its tournaments, its managing director told US media in May. China has only a few hundred courses, most with exorbitant green fees well beyond the budget of common people. But a number of the country's young golfers have continued to make steady in-roads on the world's leading tours. Li Haotong, a 21-year-old from southern Hunan Province, won acclaim at the British Open last week when he closed with a 63 at Royal Birkdale to finish third, the best result by a Chinese at the men's majors.